This is a Garry Shead original Black and White Aquatint fine art etching titled Tango-VII, it is limited in edition to 50 only, Tango VII is one of three new Tango images and was released in May 2014, it follows on from the successful Tango series that first started in 2002/3 with the original Tango I, then Tango II, Tango III, Tango IV and now Tango V, Tango VI, Tango VII. All of Garry Shead etchings are hand signed, these fine art aquatint original etching prints are made on Hahnemuhle fine art archival paper and Charbonnel etching ink from France. 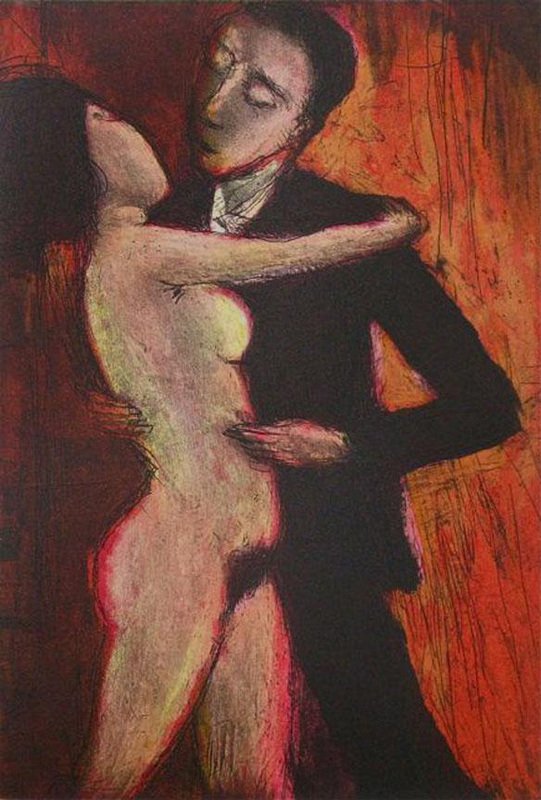 The Tango VII image size is 19x13cm, the recommended retail price is $990 for now, Tango VII is available at Etching House framed or unframed. Etching House is proud to support and specialize in limited edition fine art Etching prints and has done since 1977, making Etchings is a skill and a technique that over time is becoming rare. The Garry Shead Tango series of etchings now seven in the series and spanning 2002 to 2014 are all made from traditional etching plates and using the traditional technique, this etching technique was first used as far back as the year C 1400, Garry Shead like Norman Lindsay is a brilliant and highly respected etcher and a true master with the aquatint technique.